I love having fresh herbs right outside my kitchen door to snip when I’m cooking. 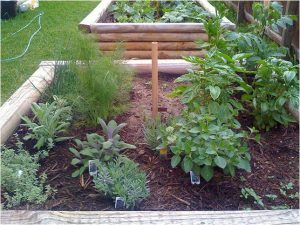 It is surprisingly easy to grow a large variety of culinary and tea herbs in a small space. Here’s how. Perennials. Choose from many culinary herbs such as oregano, thyme, sage, chives, rosemary (‘Arp’ variety does best in WNC), lavender, and mint. A word of caution: to avoid mint invading your entire garden, plant it in a container. Biennials. Parsley is a biennial herb that many gardeners replant every year. The first year you will have the delicious leaves and the second year it goes to seed. Annuals. The most common annual herbs are basil, dill, chamomile, and cilantro. In general, perennial herb transplants are readily available. Most annual herbs start readily from seed. 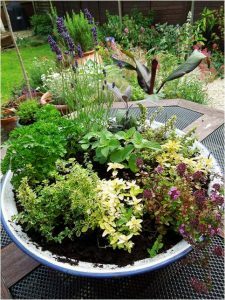 Grow herbs in a container or in the ground? Either! If you are limited on space or sun, consider containers. I have good success with metal tubs that you can find at most hardware and big box stores. You can pack lots of herb plants into a large tub. Just remember to punch holes in the bottom for drainage—a hammer and nail work great. 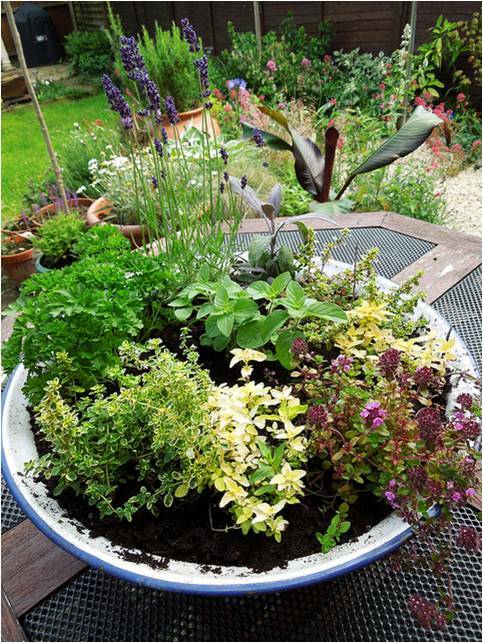 You can also plant several herbs in a 14-16-inch round or square planter with drainage holes. Use 3 parts potting mix (NO fertilizer or moisture beads) and 1 part organic matter—such as compost or leaf mold—mixed into the top half of the container. For in-ground growing, choose a space that drains well. A 3-foot by 3-foot area can easily accommodate 8 to 10 perennial herbs. Work organic matter into the top 4-6 inches of the soil and you’re ready to plant. Group herbs that have like growing needs together. Most herbs require 6 or more hours of sun a day, but dill and cilantro can tolerate partial shade. 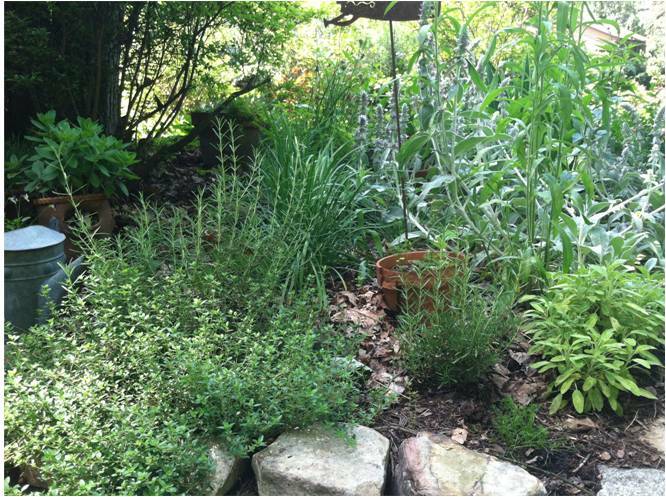 Perennial herbs prefer hot dry conditions. Biennial and annual herbs require more water and organic matter. 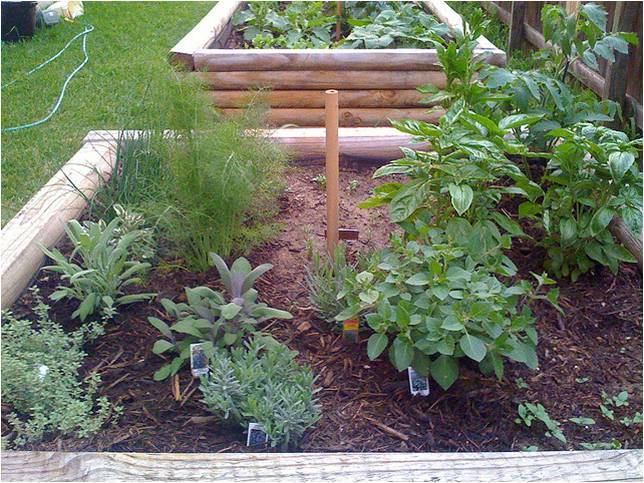 Fortunately, herbs have few pests or insects. You can harvest up to 75% of a season’s growth at one time. Clip herbs in the early morning for best flavor. Cut perennial herbs for use until one month before the first projected frost date to avoid stimulating new growth that may not harden before winter. Harvest annual herbs right up until frost. Harvest flowers, such as chamomile and lavender, before they are in full bloom. This maximizes flavor and shelf life. To encourage a second fall flowering of lavender, harvest the flowers in early summer, then cut back young plants by half their height and older plants by one-third. Do not cut into the woody, brown stem of lavender or it may not generate new growth. Use fresh-cut herbs and flowers in cooking or diffused in water for teas. Use 2-3 times the amount you would use of dried herbs. Drying is the traditional way to preserve herbs. Use a food dehydrator, or tie a small bunch of stems together with string and hang upside down in a warm, dry spot, with good air circulation, out of direct sunlight. When the herbs are completely dry and brittle, store them in glass jars for up to one year. Freezing chopped fresh herbs or flowers in water in ice cube trays is another great way to preserve the herbs. When you need herbs, just drop the cubes in soups, stews, sauces, or water for tea. Perennial herbs should survive the winter without additional protection, if planted out of direct winds and lightly mulched. Horticulture Information Leaflet, “Growing Herbs for the Home Garden”, NC State Extension Horticulture Publication. Horticulture Information Leaflet, “Harvesting and Preserving Herbs for the Home Gardener”, NC State Extension Horticulture Publication. Horticulture Information Leaflet, “Winterizing the Herb Garden”, NC State Extension Horticulture Publication. Cornell Book of Herbs and Edible Flowers by Jeanne Mackin, Cornell Cooperative Extension, Ithaca, New York, 1963. Article written by Debbie Wood, Extension Master GardenerSM Volunteer.